Call 800-975-0463, mention invitation #FASZ, get approved by 6/15/06, make one purchase each month during the first 12 months, get 1,000 bonus miles credited to your account each month for a total of 12,000 bonus miles. While this all sounds good on the surface, I would actually recommend staying away from this card. Miles cards are best when they can be used to purchase tickets that would otherwise be too expensive, such as first class or business seats, or last minute flights. 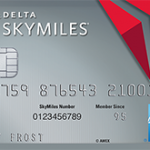 In contrast, most general miles cards that allow you redemption on a number of airlines, like this one, have significant restrictions on award redemptions. In fact, this card from Discover requires that all round trip coach tickets be purchased at least 21 days in advance and have a Saturday night stay, among other restrictions.